Hello my Geek Q’ers! 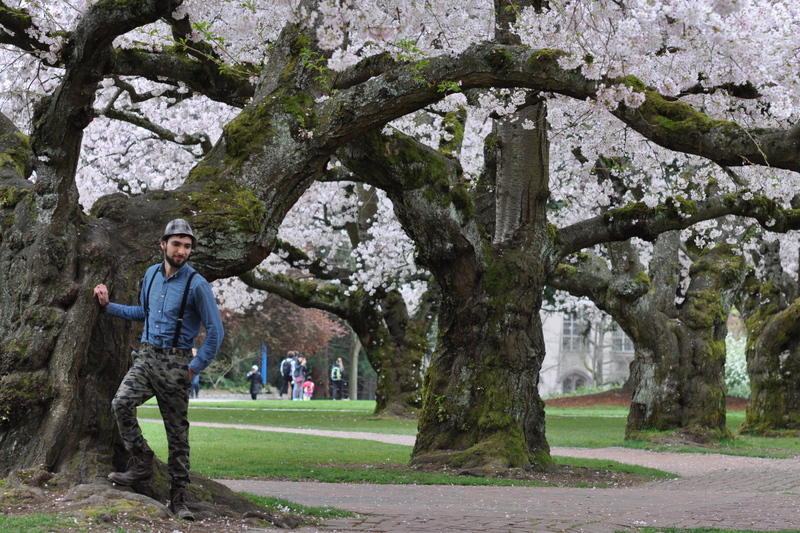 Remember that on my Black on Black post I mentioned how beautiful the University of Washington gets during spring time? 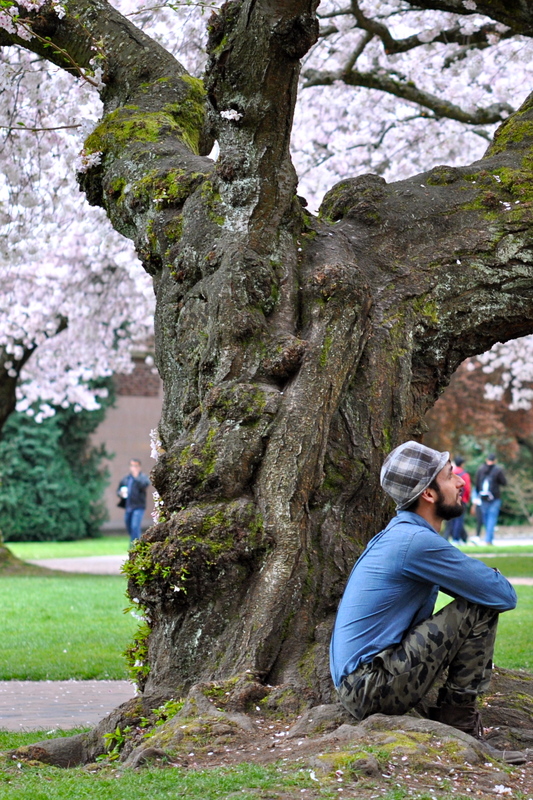 Well, last week, my blogger BFF Kim and I decided to pay a visit to the cherry trees in the UW quad to watch the blooming cherry blossoms. I can’t tell you how exciting that morning was! 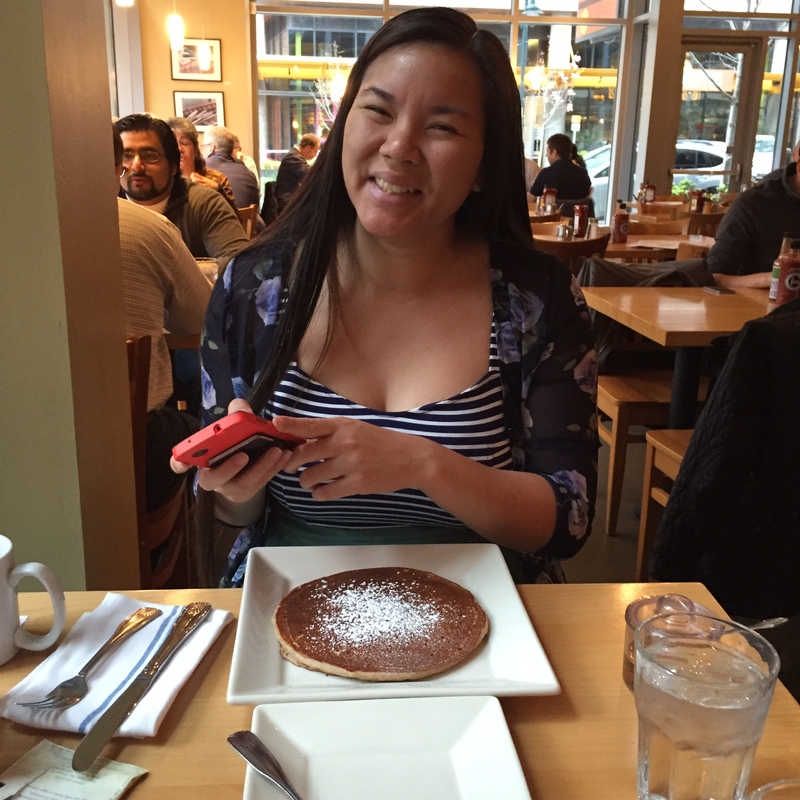 It started with us heading for an early brunch at Portage Bay Café. Portage Bay is one of my favorite places to eat in Seattle since not only do they offer a great variety of delicious brunch options such as pancakes, French toast, waffles and more, but they have an amazing fruit bar where you can put whatever you want on your dish. Isn’t that amazing? Plus Kim and I had time to catch up since we hadn’t seen each other in such a long time due to our travels, and we had a great chat. Thanks for sharing your morning with me Kim, it was wonderful! I really had a great time and couldn’t stop smiling for the whole day. Now, on to the outfit shots! I usually go for an everyday, casual kind of look, but in this occasion I wanted to take it a bit further, more along the lines of an editorial look. 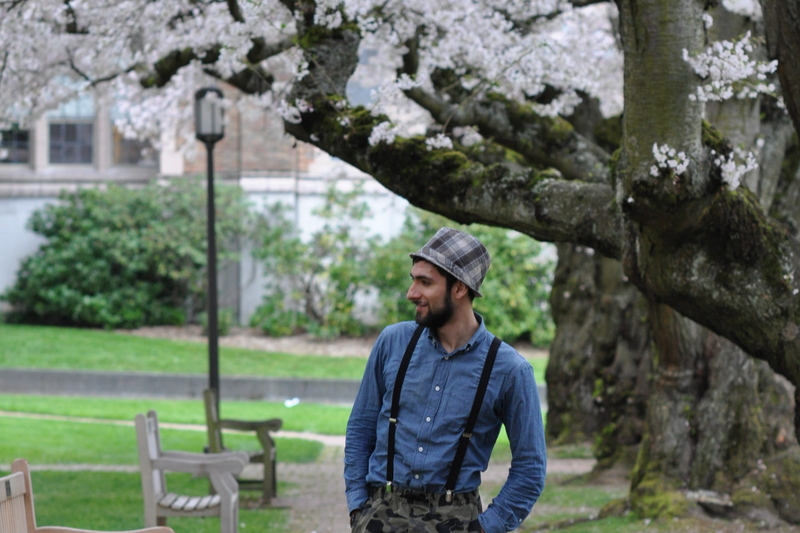 I’ve been wanting to wear suspenders on the blog for a long time, so here’s the debut of suspenders on Geek Q! 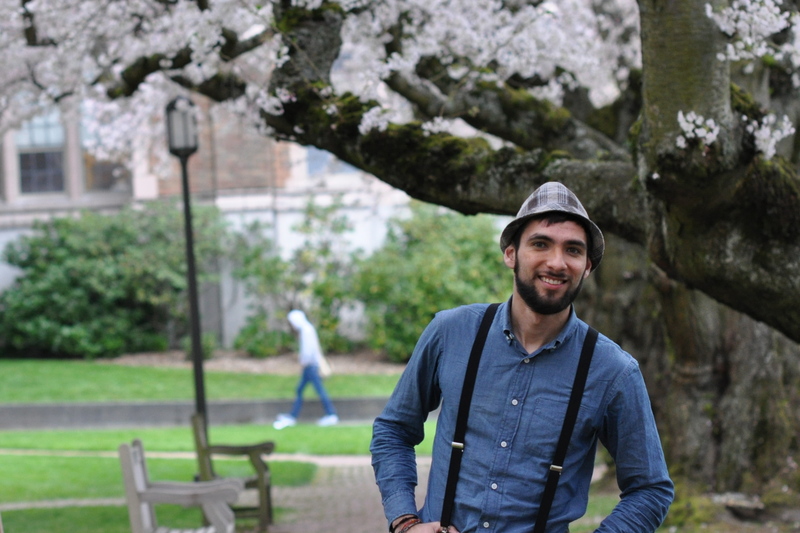 I really like the suspenders and hat look, it’s a very classic combination but in my case I decided to use a less formal hat with the black suspenders. 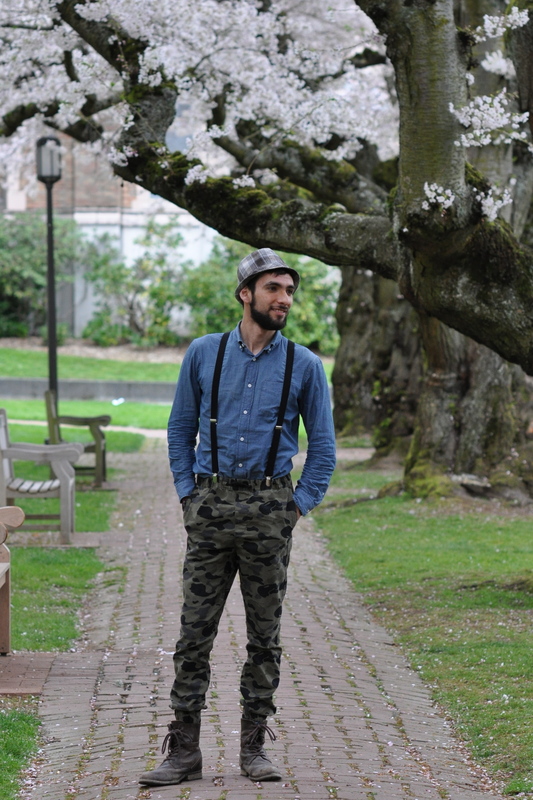 Since not everything can be crazy risks, for the main clothes I decided to use something that’s super in this spring season: a chambray shirt and camo joggers. I spotted these pants at H&M in Boston while shopping with Kim actually, and I was instantly attracted to them. Pairing these two with my old ragged boots finished the whole outfit. What do you guys think? Was this a hit or a miss? Thanks to the amazing Kim Win for taking these shots for me, I really liked them a lot. Also thanks for being you and being awesome! That’s it for now guys. I’m staying in Seattle for a few days, but I do plan to head out of the city again pretty soon. I’m going to attend the Coachella Music Festival with some of my best friends in April, which is actually just around the corner, and I couldn’t be more excited about it. Next week, expect some really nice photos from my trip to LA from this past weekend, and of course lots of fashion shots that I took with my friend Sergio. Thanks to you, my readers, for stopping by today and I hope you all have a great rest of the week, since we’re already halfway through the workweek and the weekend gets closer and closer. Remember to put your personality out there in the way you dress and to keep true to your own voice. See you next time! ¡Hola mis Geek Q’ers! Recuerdan que en aquel post Black on Black les mencioné lo bella que es la Universidad de Washington durante la primavera? Bueno, la semana pasada, mi blogger BFF Kim y yo decidimos visitar los cerezos en el quad de la UW para ver los brotes de las flores. ¡No les puedo describir lo emocionado que estaba esa mañana! Todo empezó con un rico desayuno tempranero en Portage Bay Café. Portage Bay es uno de mis lugares favoritos para comer en Seattle, ya que no sólo ofrecen deliciosas opciones para ir por el brunch como hot cakes, pan francés, waffles y demás, sino que también tienen una barra de frutas donde le puedes poner lo que quieras a tu platillo. ¿A poco no suena increíble? Además, Kim y yo tuvimos tiempo para platicar dado que no nos habíamos visto en bastante tiempo debido a nuestros viajes, y como siempre la plática fue excelente. Muchas gracias por compartir tu mañana conmigo Kim, ¡fue un momento maravilloso! Me la pasé muy bien contigo y no podía dejar de sonreír en todo el día. Ahora sí, hablemos este atuendo y las fotografías. 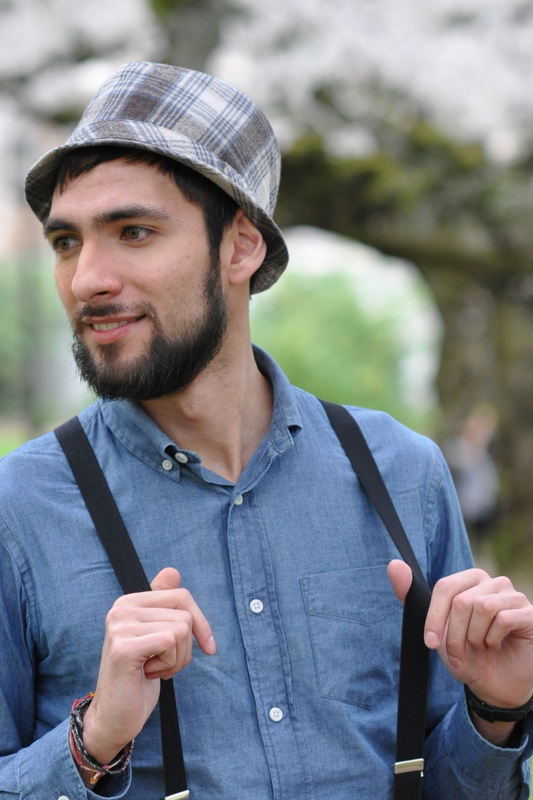 Usualmente, me voy por un look casual, cotidiano, lo que vestiría en un día cualquiera. Sin embargo, esta vez me incliné por un look un poco más editorial. Ya tenía rato que quería salir con tirantes en el blog, ¡así que aquí está el debut de los tirantes en Geek Q! Realmente me gusta mucho como se ven los tirantes con un sombrero, es una combinación clásica y muy elegante. 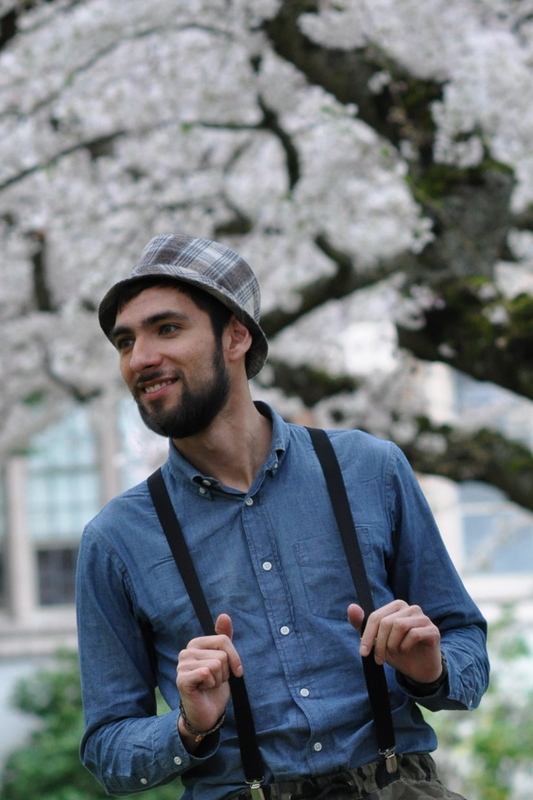 No obstante, en mi caso decidí utilizar un sombrero un tanto informal con los tirantes negros. 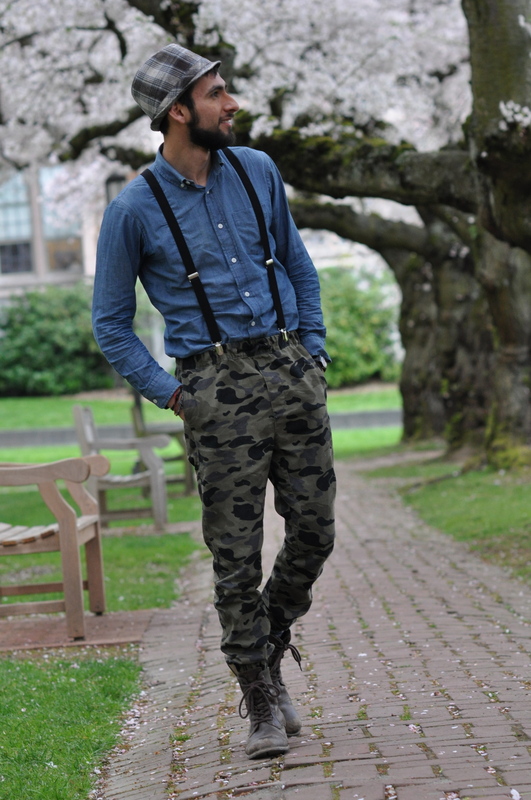 Dado que no todo pueden ser riesgos alocados, para la vestimenta principal quise utilizar dos prendas que están muy de moda esta temporada: una camisa de mezclilla y joggers de camuflaje. Encontré este par de pantalones en H&M en Boston, yendo de compras con Kim precisamente, y me sentí atraído a ellos instantáneamente. Combinando estos dos con mis botas viejas y desgastadas, terminé este outfit. ¿Qué les parece? ¿Les gustó o no les gustó? Muchas gracias a la increíble Kim Win por tomar estas fotos, realmente me agradaron bastante. Además, muchas gracias por ser tú, ¡y por ser lo máximo! Eso es todo por hoy chicos. Me quedó en Seattle por unos días, pero de todos modos planeo salir de la ciudad pronto. Iré al festival de música en Coachella con algunos de mis mejores amigos en abril, para lo cual no falta mucho así que no podría estar más emocionado. La siguiente semana pueden esperar unas fotos muy padres de mi viaje a LA este fin de semana, y por supuesto muchas tomas fashion que realicé junto a mi amigo Sergio. Muchas gracias a ustedes, mis lectores, por visitar mi blog y espero que todos tengan un excelente resto de la semana, ya que ya estamos a la mitad de la semana de trabajo y se siente cerca el fin de semana. Recuerden proyectar su personalidad en la manera en la que visten y mantener en alto su propia voz. ¡Nos vemos la próxima vez! That food looks so good! I like the boots. Thank you! It was amazing! 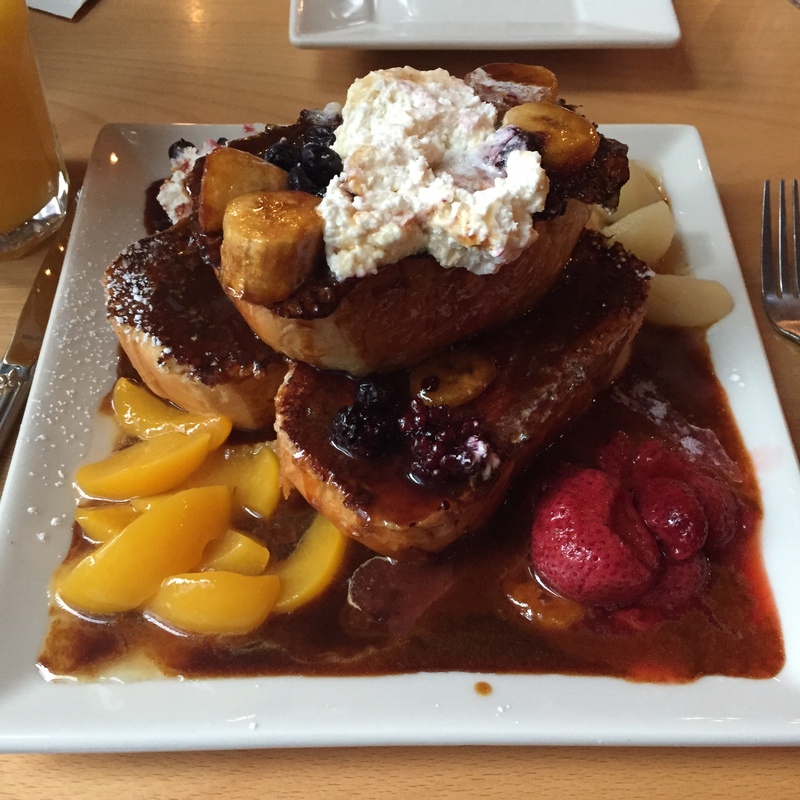 It’s my favorite dish at Portage Bay, the banana foster French toast. Thanks for the shoe compliment! Cool outfit. I nominated you for the Liebster Award. It’s the most beautiful campus IMHO. You’re so lucky to call this your alma mater, thanks for reading!! It’s so easy to get caught up in work that you sometimes forget how good it feels to just take a break and enjoy your beautiful surroundings. I feel so lucky to have spent that morning in such a perfect way. Thank you for stopping by!! 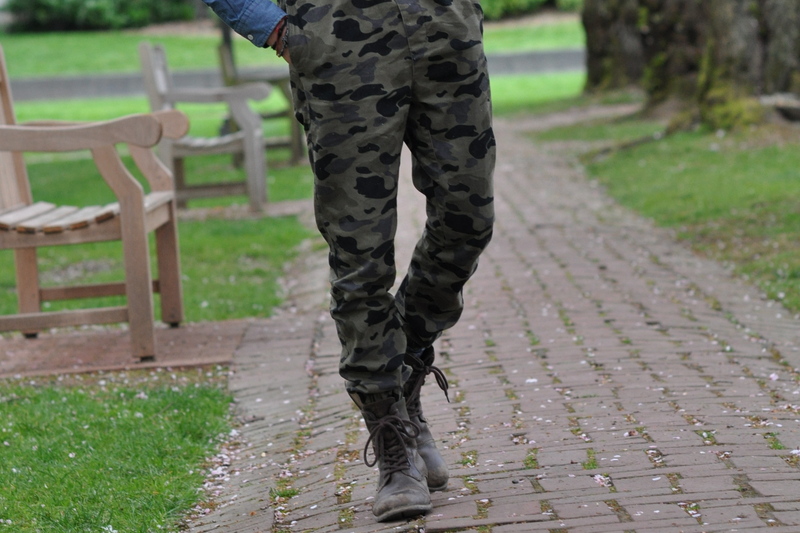 the camo pants is really nice! Thank you! It’s like the perfect combination: camouflage and joggers haha. Thanks for visiting!